WIN a pair of SHWINGS!! Is it a bird? Is it a plane? No its Super Tiger in his new Super Cool Shwings! These Shwings are great for updating tired old trainers or pimping out new ones. Tiger loves these and is convinced it helps him run 'super fast!' and jump 'like a grasshopper!' He definately feel like a super hero in them! 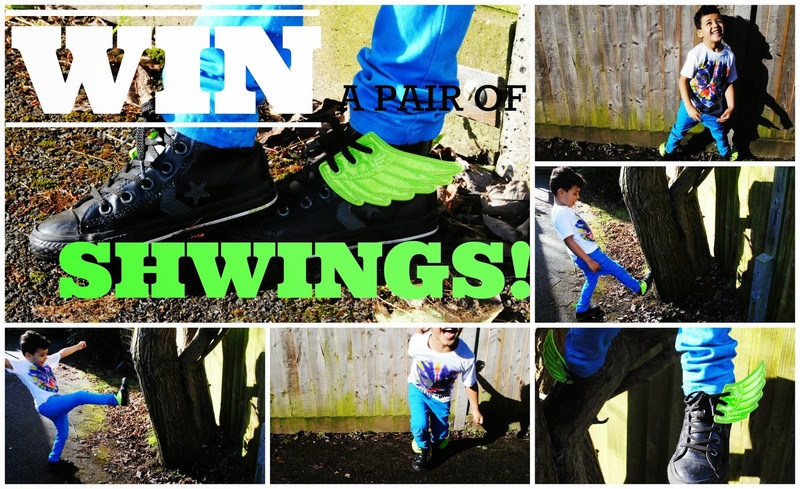 These lime green Shwings add an instant splash of colour, they are easy to attach and will fit any laced shoes. If you would like a chance at winning a pair of lime green Shwings all you need to do is simply comment below (UK entries only) You can get additional entries by tweeting this give away on Twitter or Liking Little Likely Lads on Facebook.